I believe that time is life’s most precious commodity. It, therefore, shouldn’t come as a surprise that I’ve dedicated my life to exploiting time for all its worth! My philosophy is simple: when faced with a decision, pick the option that selects for the most learning, sharing, compassion and personal contentment. Admittedly, this brazen optimization has – by design – put me on a very long and uncertain pathway through life, which certainly isn’t everybody’s cup of tea. But I must say, this approach has allowed me to live an undeniably vibrant existence, full of surprises along the way. My name is Alee Denham, I’m from Australia and I’m 30 years old. 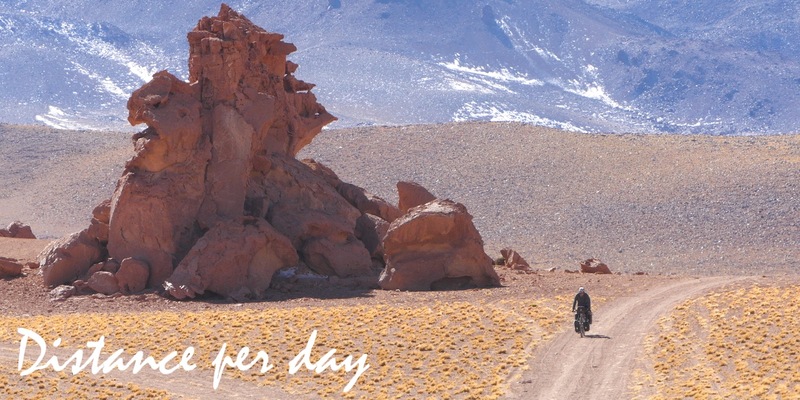 I’ve got over 100,000km of bike travel under my belt spanning four continents. 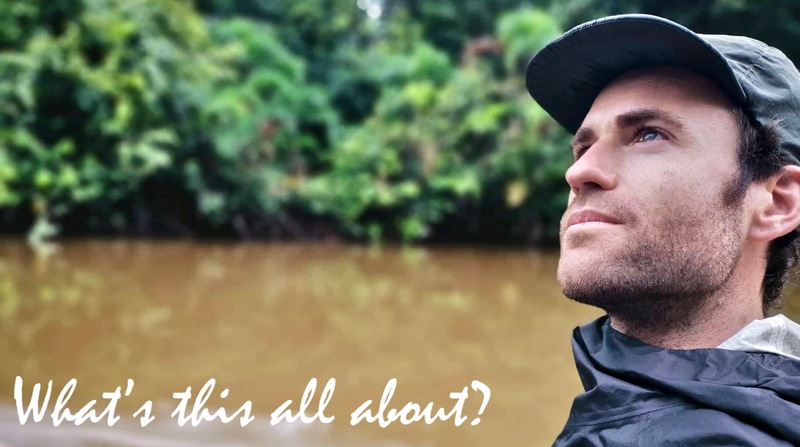 I love writing, educating, filming and sharing my knowledge of how to travel by bike. I’m currently on a three-year journey from Argentina to Alaska, pursuing the road less travelled. I’m not really motivated by the total distance, average speed, elevation gain, or even the idea of finishing this cross-continental journey. Instead, I’m addicted to the adventure, freedom, unpredictability, vulnerability and diverse range of experiences that bike travel offers me. I recognise that I’m in an incredibly fortunate position to be able to follow my passion like this. I somehow won the life lottery; I was born in a safe and affluent country, I was educated and a loving and supportive community has always surrounded me. I sometimes feel guilty about the privileged situation I find myself in, but ultimately, I think it’s more pragmatic to tip my hat to my good fortune, work hard and make the most of this extraordinary opportunity. I’ll consider my fortuitousness a success if I have helped you to add more adventure, nature and risk-taking to your life. CyclingAbout is one of the biggest bicycle travel resources in the world. Cycling and travel are perhaps my two greatest passions, and I can’t express how happy I am knowing that I can share it all with you. Once in the CyclingAbout vortex, you’ll find yourself absorbing high doses of cycling content that’ll inspire you to experience the world as I do. This website is home to the web’s most detailed tech resources, oodles of inspiration, in-depth reviews, fun videos, tips, how-tos and more. The best way to get updates from me is to ‘like’ my Facebook page, ‘follow’ me on Instagram or ‘subscribe’ to my YouTube channel. I don’t use a GPS tracker, but you can get a good idea for where I am via my social media pages – my photos and videos are always taken within a week of publishing. If you’ve learned some stuff here and want to support my mission to spread the bike travel love, that’d be very much appreciated! You can donate to this website by simply becoming a member HERE, or contribute a one-off amount to say thanks for sharing HERE. Without this generous support, this website would not be as you see it! Bicycle travel provides a rich sensory experience all day, every day, where you become completely immersed in the environment around you. There is no hiding from the world as your senses are saturated: hearing birds rejoicing in the trees, smelling lunch cooking on a roadside stall, tasting the salt dripping from your brow, feeling big raindrops soaking your skin and seeing the sun setting over the horizon. 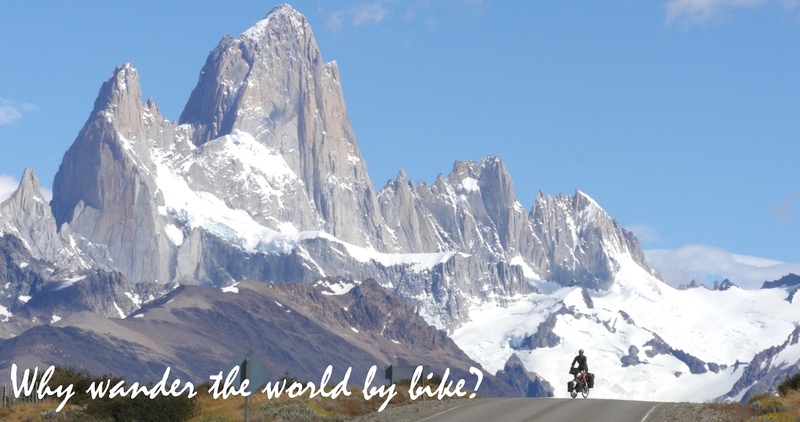 Bikes reconnect you with the world! 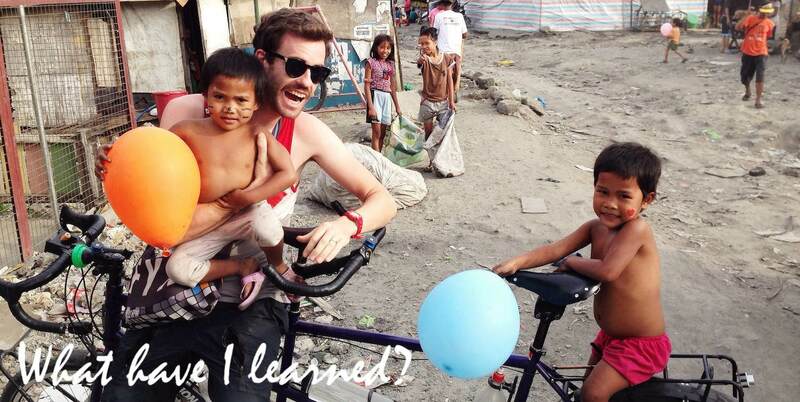 Bikes also break down barriers: you’re instantly innocent and approachable to everybody. These people will teach you all about their lives and their fascinating local cultures. On top of all that, you’ll be constantly extracting physical and mental stimulation from the riding experience, discovering just how capable and self-reliant you can be. I am sponsored by KOGA and am riding their WorldTraveller-S. It is decked out with all the best touring parts, including a Rohloff 14-speed gear hub, Gates belt drivetrain, Shimano XT brakes, Tubus racks, Schwalbe tyres, Schmidt dynamo lighting and a Cinq USB charger. I actually designed the handlebars, which are now an item you can buy too! The best thing about my bike is that it’s completely overbuilt so I don’t have to worry about anything breaking. In the last 16 months, I’ve broken just one spoke and had a handful of punctures, that’s it. You can see a video explainer of my WorldTraveller HERE. 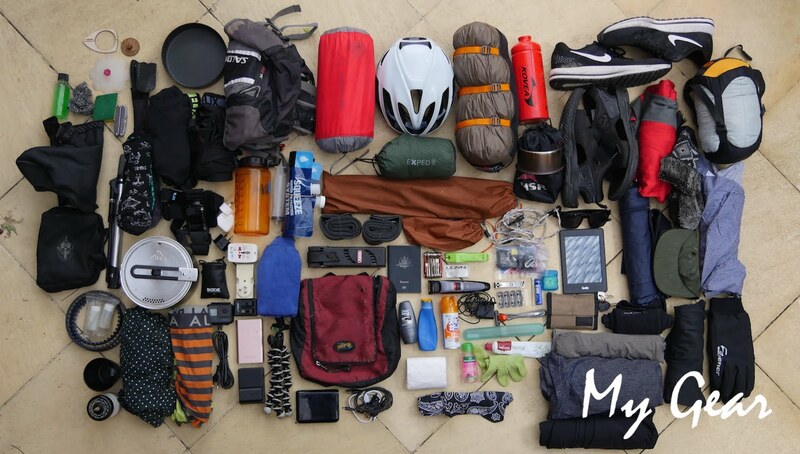 I’ve been lugging around about 24kg of bags and equipment over the last year in South America. You can see every item and its weight HERE. This is a bit heavier than I’d like, but it’s all gear that I can depend on, and it has even kept me warm at -20C (just). Whenever I break any equipment, my policy is to replace it with something stronger and longer lasting (usually heavier), which is particularly important when you travel for years at a time. This is such a common question for me, and I think people forget that ‘being alone’ and ‘being lonely’ are two different concepts. Remember that you can still feel lonely with a big family and lots of work colleagues all while living in a city of millions. I’m happy floating in my own thoughts, breathing fresh air, reading books and listening to podcasts. I have conversations with new people every single day, many of whom I will see again. I wouldn’t want to be in this state forever, but for now, it feels like such a luxury. 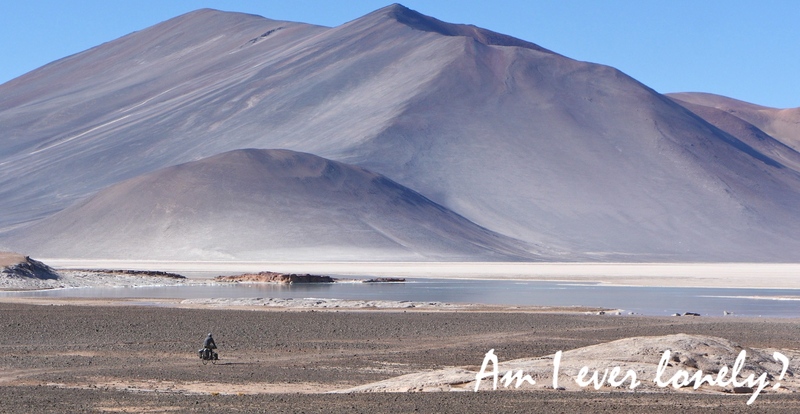 If the idea of ‘being alone’ stops you from travelling, I suggest a re-think. You’ll get better at being by yourself every day that you do it. Take a week off, pack some stuff to keep your mind active (books, paintbrushes, movies, podcasts, a diary, a camera) and enjoy the world! I use a smartphone to navigate, which is the most user-friendly in terms of screen function (pinch and zoom etc) and on-the-fly route modification. It’s also very easy to download offline maps and import/export GPX files. The only time when I’d prefer a dedicated GPS is when it’s raining. I charge my smartphone using a Cinq The Plug III dynamo charger; my front wheel is able to generate enough power for my phone when I cycle faster than 12KPH/7MPH. For the more mountainous parts of the world, I actually use my laptop as a big battery pack to charge my phone at night. My favourite apps for navigating are MapOut (for remote areas) and Maps.me (for services in cities). I sometimes import the GPS routes that others have completed to use as a rough guide. Other times I look at satellite maps to trace out all the dirt roads that don’t normally appear! I tend to cover about 120-130km on the flat and 75km in the mountains. Basically, it’s however far 7 or 8 hours of cycling gets me. My longest day was 365km over 20 hours. My shortest days have been less than 10km. When you cycle as much as I do your bike becomes an extension of you – I think I’d fall asleep before my body got tired of riding! I’ve been travelling for the last six years as a vegan. It was a really big decision for me to align my morals with my actions, so I’m very proud of myself for both arriving at this decision and sticking to it! There aren’t many people who travel to the places I do on a vegan diet, so I’m stoked that I can pave the way for other explorers, showing that you can be incredibly healthy and strong without animal-based foods! Bread, pasta, oats, vegetables (all), fruit (all), dried fruit (prunes & apricots), lentils, beans, nuts (peanuts, walnuts, almonds), seeds (chia, sesame, linseed), hot sauce, spices, biscuits, jam, avocados, potato chips, dark chocolate. I mostly sleep in my tent as there is often no accommodation where I like travelling. My tent is my space to relax and unwind after a hard day on the bike; it’s comfortable and dry and it can be pitched almost anywhere I go. 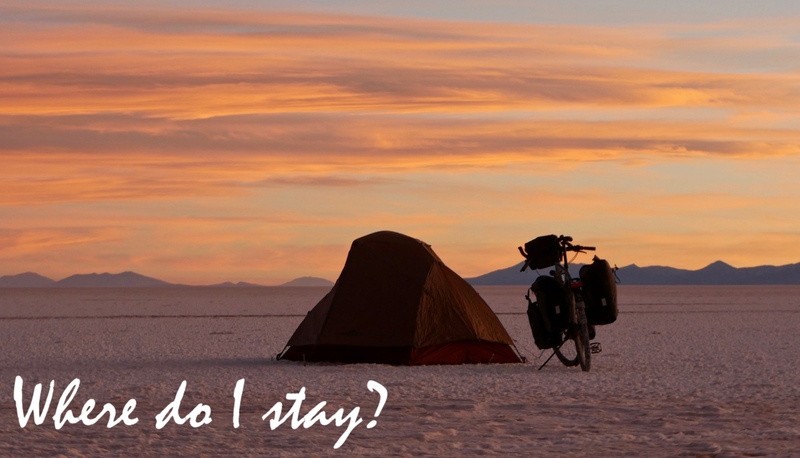 Over the last year, I’ve calculated that I slept in my tent around 20 nights per month… that’s 240 nights in a year! Through tropical/hot regions, I tend to spend more time in hotels, hostels or with locals so I can get a much better night sleep. I’ve learned that people make the world go ’round: it is always the people who make a place, who change your perceptions and who open your hearts and eyes. I’ve had the most incredible travel experiences in the dullest of places. I’ve also learned that the world is much bigger than it looks but that no matter how different its people look, act or cook; we humans are all fundamentally the same. And that is AMAZING! For much more, check out my article 11 Life Lessons That Changed How I View The World. I spend a lot of time taking photos and filming my adventures. Whenever you see me riding my bike in a photo or video, the camera is actually sitting somewhere on a tripod! It obviously takes a lot of time to set up these shots, but I think the results are worth it. To get started I worked for about one and a half years saving as much of my earnings as possible. I then sold off the possessions I knew I wouldn’t need over the next few years. After saving so much that I didn’t believe my bank balance; after selling so much that very little was left at home; after being entirely thankful that I live in such a lucky and affluent country, I was able to travel for more than two years. 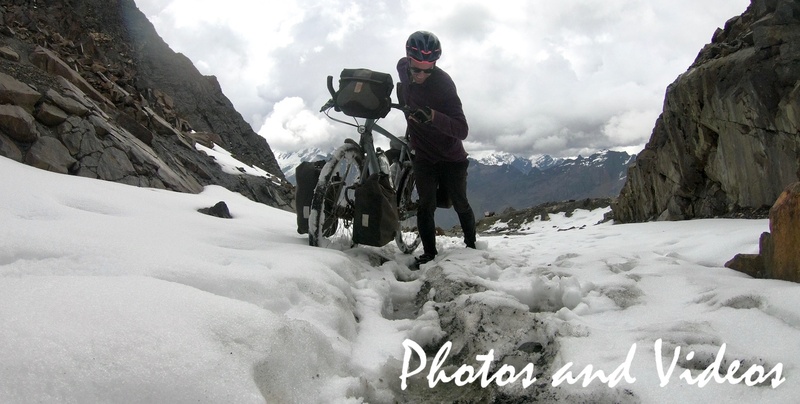 Nowadays I make enough money from sponsors, book sales, freelance writing and generous CyclingAbout donations to continue sharing my knowledge and adventures. If you’ve made it all the way to the bottom of this page and would still like to know more, I’d suggest heading to my FAQ Page. 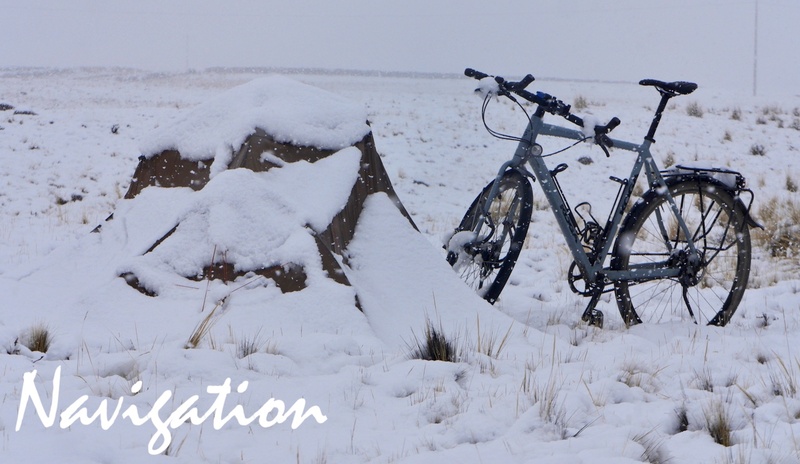 If you’d like to travel by bike, but don’t know where to start, check out my book Bicycle Touring in One Hour. If you’d like to know all the important details about touring bikes, download a copy of the Touring Bicycle Buyer’s Guide which is updated yearly. 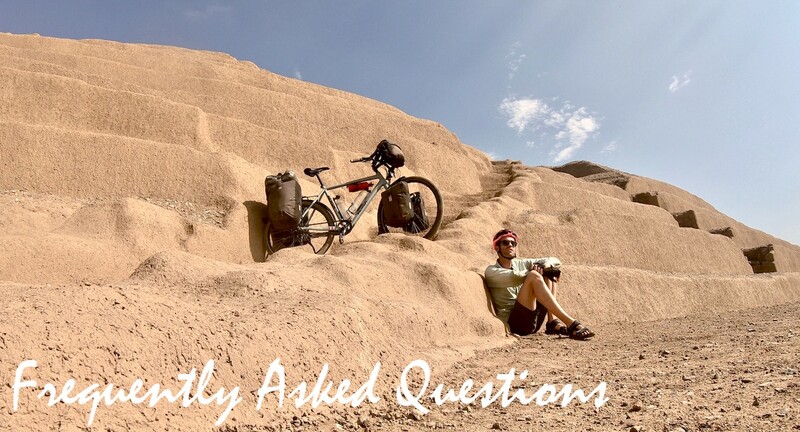 Oh, and I’d love it if you could support my mission to share bike travel knowledge and adventures! Without the help I receive from generous humans, this website wouldn’t be brimming with information like it is today.